Before I start uploading long overdue posts though, I’d like to get the ball rolling with something much more current. On the Wednesday before last at around 6am, I found myself heading through the (extremely) foggy countryside towards Donington Park circuit in Derbyshire. 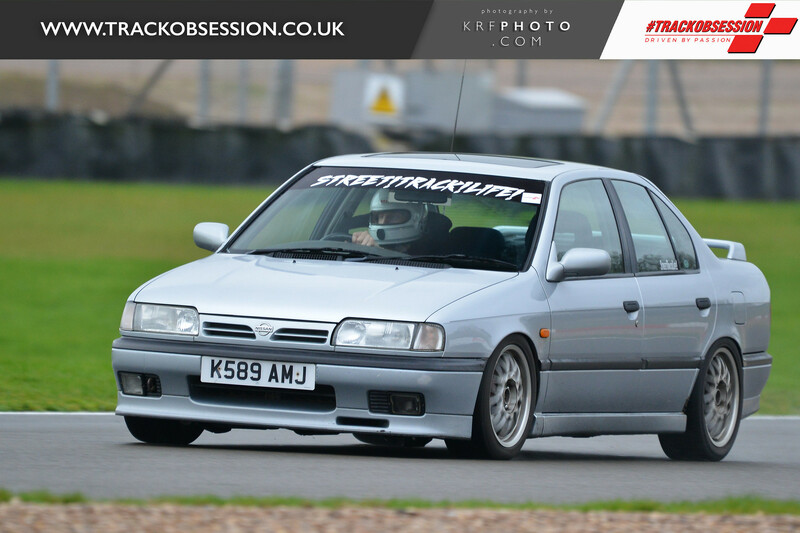 Having asked the people of Instagram a few days prior as to which circuit I should head to for my second non-drifting track day, Ryan Stewart suggested I should check out an upcoming Track Obsession day at what was one of the most memorable tracks from my youth; Donington Park. A few clicks later, I was booked in to the event and turned my attention towards making a to-do list of preparation for the trusty STL! Primera. 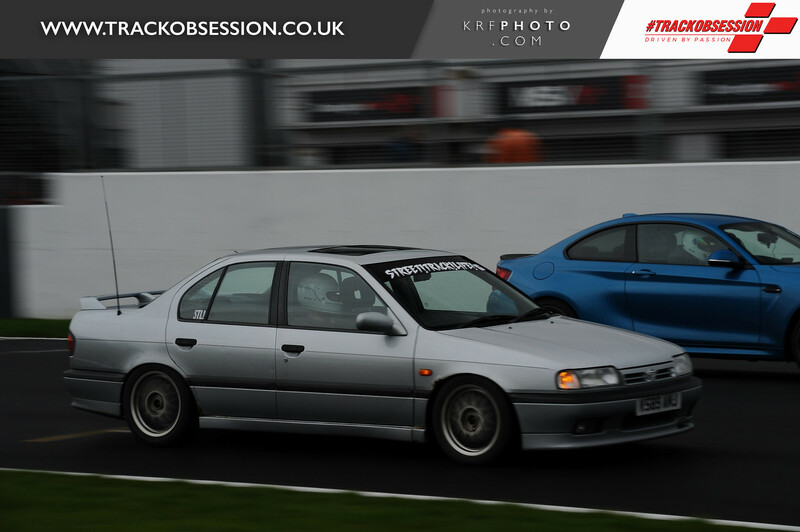 Donington Park is a well known circuit to anyone who grew up watching BTCC, with the 1998 race involving Nigel Mansell and his Ford Mondeo in torrential rain being one of the most memorable moments (watch here). If you used to play TOCA as a kid, you’ll also be familiar with the track. Formula 1 aficionados will remember it for one of Ayrton Senna’s most legendary laps. Preparation on the P10 extended to nothing more than a check of every important nut and bolt, a quick fluid level check and a brief trip to a local tyre garage to have my front Federal RS-Rs swapped over (my previous track day at Anglesey had taken its toll on the outer edges, probably due to a lack of front camber mixed with very high speed corners). After chucking my toolboxes, a few assorted Nissan spares and a trusty Tesco Meal Deal into the car, it was time to make the relatively short journey to Castle Donington. While mid-week track days are undoubtedly awesome in terms of convenience, it does unfortunately mean that you have to battle with commuter traffic on the way to the circuit, so leaving yourself a little extra time to catch the drivers briefing is recommended. I arrived at a very wet and very windy venue. With nothing but a big blue tarpaulin in my boot to keep my belongings protected from the elements, I held off from unloading the car and instead made a dash for a coffee (cool MSV branded cups, by the way) in hope that the weather would sort itself out. Check out this poster of the aforementioned Nigel Mansell that is proudly displayed in the circuit restaurant. Super tourers forever. While the weather wasn’t going to let up any time soon, a very generous Ryan offered to share the use of his and his brother Ash‘s pit garage for the day. Having spent the few minutes prior watching others battling to protect their equipment from the Midlands rain, I was extremely grateful. Once the drivers briefing and three sighting laps were complete, I decided to sit things out for the first half an hour or so as, while the rain had pretty much stopped, the track was still super greasy and half dry/half wet (i.e. super sketchy) in places. This gave me a good chance to check out the pits in the meantime, at least. These MX-5s both looked pretty serious. The turquoise one didn’t seem particularly fast in a straight line but it was of course great in the corners, which made for some great fun later in the day when I got to chase it around for a few laps. Ash’s Golf R. I’ve never really seen one of these being used for anything other than racing up and down bypasses before but in the wet/dry conditions it was an absolute weapon and probably one of the fastest cars out there. …and an equally serious Mk5 Golf. It was great to see an Evo out on track; I really don’t come across too many of these any more. Si‘s very keen DC5. I’m told this is an ex-Mugen touring car shell, which is pretty awesome. The stalwart of any UK track day; the Renault Clio (172, 182 etc.). These are so cheap nowadays and offer so much bang for the buck. This particular example was completely stripped and properly caged, so I can imagine just how much fun this thing must be to chuck around. Turbo MX-5 that was also out on track. This thing had some serious straight line speed but I imagine it was pretty lairy in the damp corners. Unfortunately I didn’t see this aired out Audi on track but never mind, it looked pretty cool parked up in the pits. Is this a Mk2 Scirocco? I’m really bad with classic VWs but it was great to see this example getting a good kicking on track. A quick snap of the P10’s interior before I joined the track. The shift knob is a new addition; I picked it up from G-Corporation at Tokyo Auto Salon back in January. When I ventured out onto the circuit, a dry line was beginning to form but the consistent drizzle meant that traction levels were still pretty limited. In fact, the grip levels at each corner felt like they were changing every lap, depending on wether the sun had made a brief appearance of if the rain had begun to pour a little heavier. Either way, it meant that it was very difficult to drive with confidence. While the P10 is quite “idiot proof” with its predictable FWD turn-in, there are some times when I would much prefer to be in a RWD car, with this was one such situation. 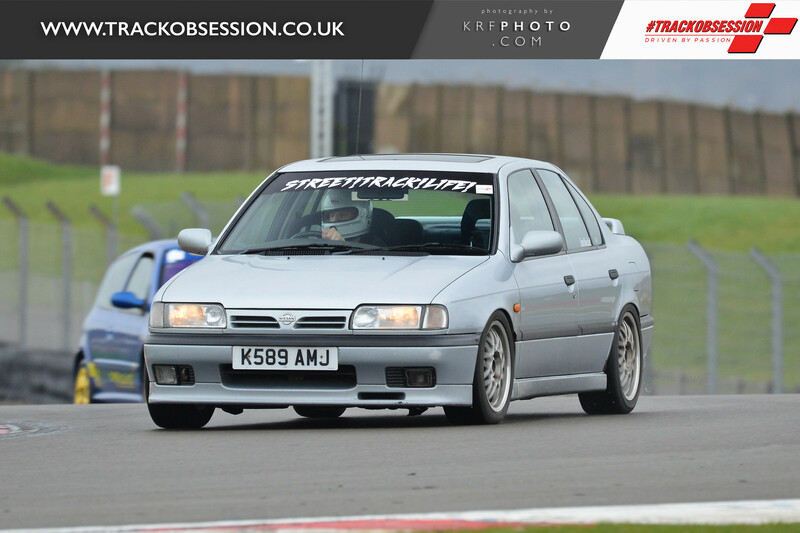 The Primera (as with the P10s belonging to my friends) has a tendency for big oversteer during severe weight transitions and, in these damp and greasy conditions, led to a few lairy moments with some comical amounts of oversteer and flapping hands from myself (see the first clip in the on-board video lower down this post). I’m still not entirely confident with sliding a FWD car around; personally I’d much rather steer with the throttle in a RWD platform and just power myself away from the potential trip into the gravel trap. Unfortunately for some, the conditions proved a bit too much and there were a handful of red flag situations whereby a stricken car needed recovering after an off-track excursion. Adding to this was a major oil spill by one car that saw quite a big pause in the action as the circuit staff worked hard to remove the spillage. If the conditions were dry, I was told this would take just a few minutes but, of course, the track was soaking wet and the process took a lot longer. 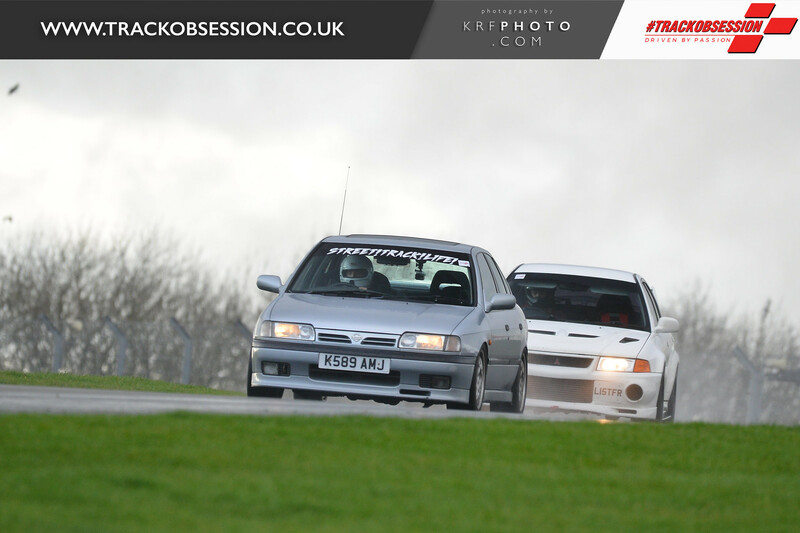 Si’s DC5 was quickly approaching in my rear view mirror as we headed down the start/finish straight but, when I checked my mirror as we dipped into the Craner Curves, I was temporarily mesmerised as I watched his Integra slide off the track backwards and into the gravel. Later in the day another red flag was shown just as the track was beginning to dry out properly. It was very much justified though, as the engine bay of this EP3 had gone up in flames. Nevertheless, everyone involved with the car seemed in high spirits as it was recovered back to the pits. Once the track reopened, I grabbed some passenger laps with Ryan in his E92 M3. When I say “laps”, in reality it was a 20/25 minute session at full tilt, with plenty of hair raising moments on the semi-dry and greasy surface. This was my first time on track in a fast modern car and the first thing that struck me was how much I could feel the weight of the M3, despite the various weight saving measures and Bilstein suspension keeping everything under control. However, the mechanical grip was huge and it was interesting to watch how Ryan would react once the back end would begin to go light. My natural reaction (coming from a drifting background) would be to simply pin the throttle and let the car steer itself, whereas Ryan would gently wrestle the car back into shape with small steering inputs before putting his foot down. I’m sure this is the much faster way to get round the circuit in these conditions, whereas my “technique” would certainly have me looking at a black flag or two from the marshals (I’d have some great photos to look back on though, for sure). With the track due to close at 5pm and with a red flag being shown at around 4pm, lots of people began to pack up and head home. However, I still hadn’t been able to enjoy a properly dry track yet and I was determined to wait it out while hoping that the early evening sun dried the surface somewhat. My patience paid off and a few of us rejoined the circuit at around 4.30pm for one big final session. After finding my groove I well and truly gave the trusty P10 as much of a kicking as I could; I love that this car can take so much abuse for 20/25 minutes without the temperature gauge budging at all, with the tyres and brakes getting up to temperature pretty quickly and remaining consistent throughout the session. I filmed the entirety of this session which you can see on the above video. My favourite section is when the BMW M2 driver passed me at around the 6.20 mark, which allowed me to then try my hardest in an effort to keep up. I felt like I gave it a pretty good shot considering the P10’s lacklustre 150bhp (on a good day!). …so I took a few pretty pictures and began the steady drive home. Other than some mild clicking on roundabouts, the driveshaft and CV joint survived the trip just fine. 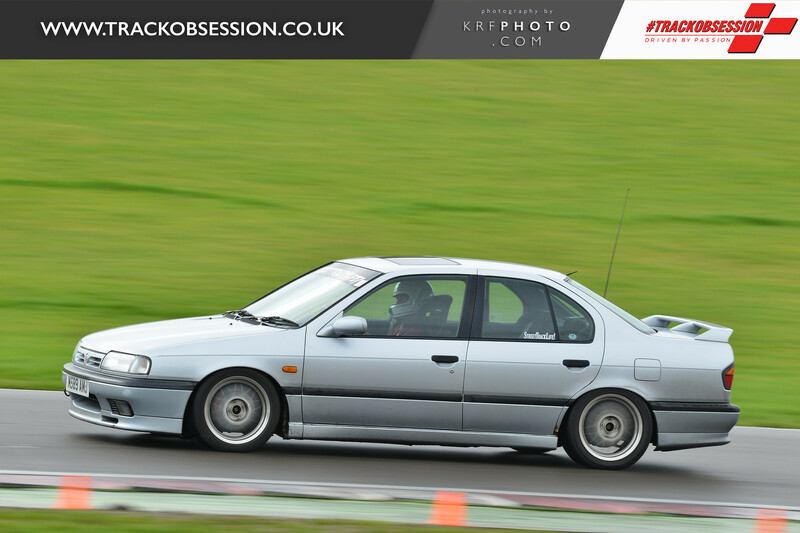 Another track day in the bag and I’m keen to do more, with my eyes set on a Cadwell Park event in the near future. The P10 continued to impress me with its robustness and cheap thrills nature. However, I can already see myself getting a little bored of the (lack of) power further down the line, especially at bigger circuits. A proper SR20VE build is far from cheap and will still barely push much past the 200bhp mark, so I would be lying if I said I hadn’t been thinking about reconfiguring my much faster C33 Laurel (and infinitely more tuneable in terms of power) for some track day use. However, unlike the P10, this will require extensive heat management consideration for the likes of the existing oil cooler (which is currently just wedged under the slam panel) and perhaps the addition of gearbox and diff coolers, along with proper ducting for the brakes. I worry that this might be overcomplicating things but at the same time I also want to go really fast (especially after those passenger laps in the E92 M3). Perhaps I will keep the P10 at its current spec for a cheap and cheerful, trouble free country lane runner and small circuit attacker, while reserving the C33 for larger tracks and more special occasions. Anyway, this is a very first world problem to have. 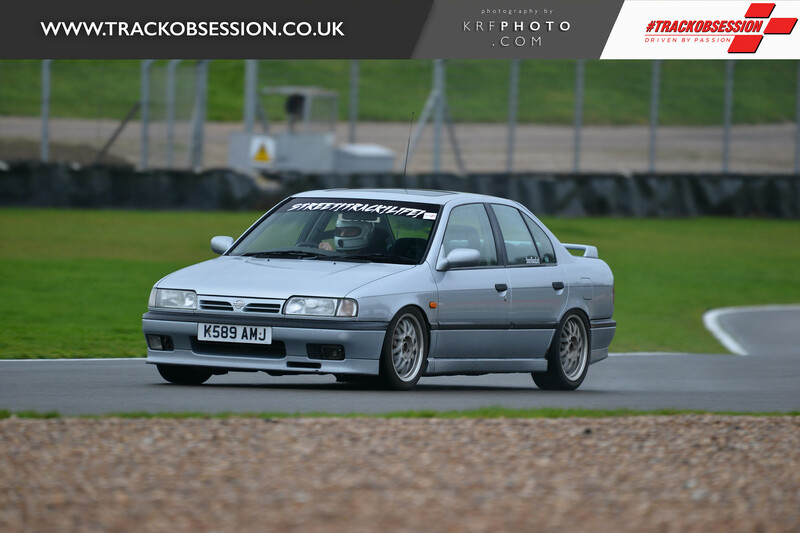 More pressing is the urgent rust treatment work that the P10 desperately needs, while the C33 could use a full overhaul after a few big hits at various drift days, so for now you can expect to see the Primera at a few more track days this year.